Cooking Shrimp... It’s easier than you think! Are you looking for information on cooking shrimp? If so, we can help. 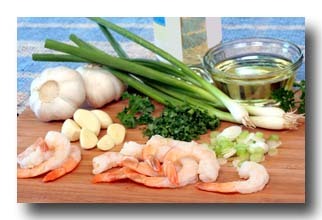 At free-shrimp-recipes.com we not only provide you with free shrimp recipes but we also provide you with plenty of information on how to cook shrimp. We provide you with all the information on cooking shrimp so that the only thing left for you to do after browsing our website is prepare your shrimp recipe and enjoy! So where do you start? Right here! The single biggest tip for cooking shrimp is Do Not Over Cook It. Whether you are charcoal grilling or gas grilling shrimp, broiling shrimp, pan frying it or deep frying shrimp, you do not want to cook it too long. Overcooking shrimp makes it tough and it loses flavor. 3. Never thaw at room temperature or under warm/hot water. 8. For Broiling Shrimp, follow our instructions for deveining shrimp on our deveining shrimp page and then spread the shell open until it lies flat, rinse it under cold water. Season and prepare shrimp, then broil in oven for 4-5 minutes. 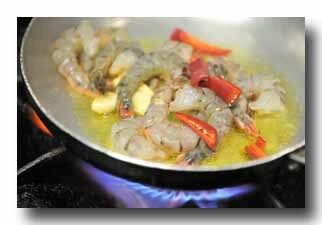 It is a good idea to baste the shrimp during broiling period to help prevent burnt edges. One thing I have learned along the way is that you do not have to follow cooking recipes 100% to get great results. (Baking may be another story) But for most of the recipes here you can play around and give them your own twist, if you dare! Or, if you haven’t looked at our How To Buy Shrimp page, start there first. This page explains, obviously, how to buy shrimp! Then, proceed to the Deveining Shrimp page for videos and tips on deveining shrimp.